Thirteen is the new twelve in the third terrific chapter of Oscar® winners George Clooney and Steven Soderbergh's criminal caper series. With a stellar cast of criminal cohorts (including George Clooney, Brad Pitt, Matt Damon, Andy Garcia, Don Cheadle, Bernie Mac and newcomers Al Pacino and Ellen Barkin), it doesn't matter if it's eleven, twelve or thirteen -- it all adds up to fun. So ... are you in or are you out? 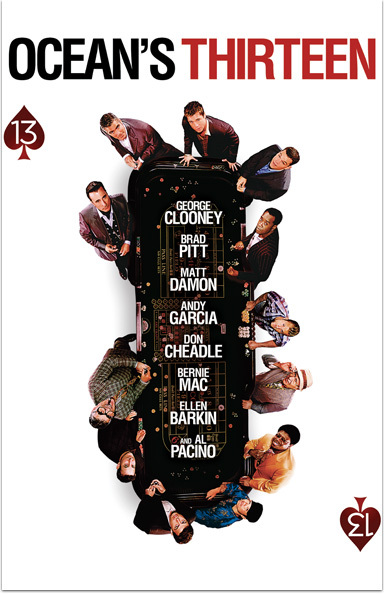 OCEAN’S THIRTEEN © 2007 Warner Bros. Entertainment Inc. All Rights Reserved.